The holy martyr Peter the Aleut (or Cungagnaq in his native tongue) was probably a native of Kodiak Island (Alaska). He is said to have received the Christian name of Peter when he was baptized into the Orthodox faith by the monks of St. Herman's—missionaries operating in the north. 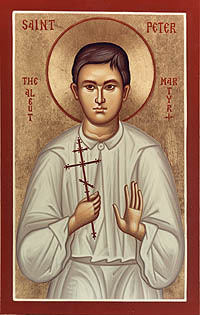 His feast day is commemorated in the Orthodox Church on September 24 or December 12. In 1815 a group of Aleut seal and otter hunters, including Peter, were captured by Spanish sailors, who took them to San Francisco for interrogation. With threats of torture, the Roman Catholic priests in California attempted to force the Aleuts to deny their Orthodox faith and to convert to Roman Catholicism. This page was last edited on October 23, 2012, at 20:11.